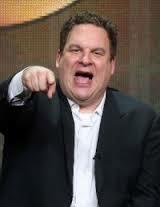 Jeff Garlin weighs in on possibility of more "Curb Your Enthusiasm"
LOS ANGELES -- Jeff Garlin thinks there's a 60/40 chance that Larry David will follow up his Broadway debut with another season of "Curb Your Enthusiasm." Garlin shared his opinion with me Wednesday night at the ABC bash for TV critics at the Langham Hotel. When another critic lent his opinion that he thought the odds were more like 40/60, Garlin channeled his loudmouth persona. "So, who are your readers going to believe?" he bellowed. "You or the fat guy that's actually on the show?" He wasn't the only big name in attendance. The evening kicked off with Oscar winner Alan Menken performing a medley of his biggest hits, including "Beauty and the Beast" and "Under the Sea," followed by the title number from "Galavant" with cast members from the musical comedy providing back-up vocals. Afterwards, I had the chance to chat with the show's Vinnie Jones, a former English footballer who has turned into a surprisingly solid actor. Jones said he would have never gotten into the thespian game if it hadn't been for Guy Ritchie, who cast him in "Lock, Stock and Two Smoking Barrels." "Before that, the notion of acting was further away then the moon," he said. Others on my dance card: Anthony Anderson, Christela Alonzo, and Timothy Busfield. The highlight: A conversation with a charming Juliette Lewis who is downright intimidating as a hard-nose detective in the upcoming "Secrets & Lies." She was completely disarming as she talked about changing her image and plans to return to the recording studio. No wonder she was almost Mrs. Brad Pitt. Coming up Thursday night: A star-studded party honoring Chuck Lorre on the set of "Two and a Half Men."